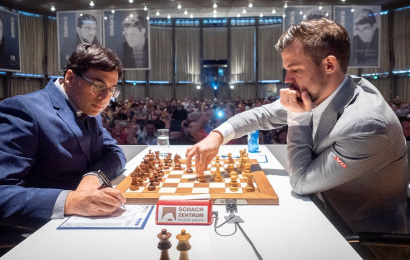 Peter Svidler beat Georg Meier to join Magnus Carlsen in the GRENKE Chess Classic lead after the World Champion allowed Vishy Anand to escape twice over the course of another six-hour marathon. Fabiano Caruana was the day’s other winner, but the world no. 2 flirted with defeat until 14-year-old Vincent Keymer cracked in the run-up to the time control. The other games were drawn, but not without a great fight. In the Open, Daniel Fridman had the best tiebreaks of 8 players on 7.5/9 (including 12-year-old Gukesh!) and will play in next year’s Classic. Carlsen: "I think I'll enjoy chess to the day I'll die"